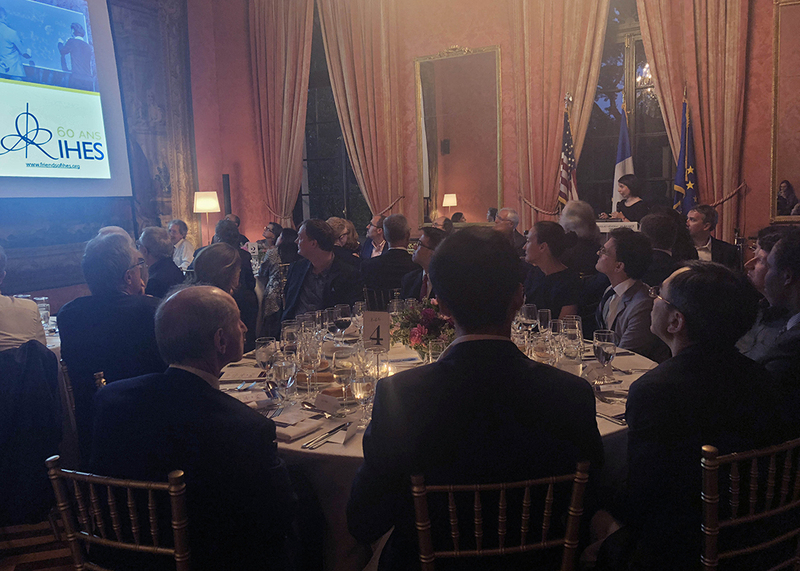 Friends of IHES chose to celebrate the Institute’s 60th anniversary with a dinner in New York. The event took place last September 10 at the Consulate general of France. More than 70 people took part to the event hosted by Michael R. Douglas, Friends of IHES Chairman and by Emmanuel Ullmo, IHES Director. The evening was an occasion to highlight the scientific, historical and philanthropic ties between the Institute and the United States. Anne-Sandrine Paumier, a science historian and a former post-doc at IHES, and Nikita Nekrasov, currently a Professor at the Simons Center for Geometry and Physics and a member of Friends of IHES board, and a former permanent professor at IHES, were invited to give a talk during the evening to retrace the long-lived friendship between IHES and American scientists. Anne-Sandrine Paumier went back to the Institute’s early days. Its founder, Leon Motchane, was an industrialist with a relentless passion for mathematics. After having visited the Institute for Advanced Study (IAS) in Princeton, he became determined to provide mathematicians with a place where they could devote themselves solely to research and profit from their mutual interactions. The Institute’s early days were strongly marked by the frequent letters between Leon Motchane and the IAS Director Robert Oppenheimer, who was a precious source of advice. Nikita Nekrasov shared some of his fondest memories at the Institute. He arrived at IHES in 2000 and spent there 13 years that were crucial to his career, as well as to his personal life. IHES sincerely thanks the Consulate for its hospitality, and its partner BNP Paribas US for its participation.